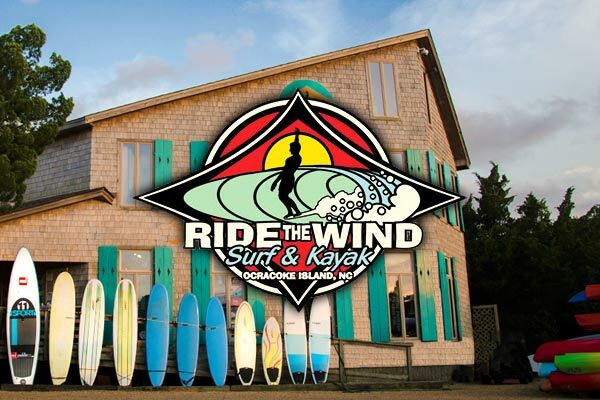 Monday through Saturday: 10 a.m.-7 pm | Sunday: 10 a.m.-6 p.m.
Ride the Wind Surf Shop is your Ocracoke source for surfboards, bathing suits, apparel, accessories, sunglasses, kayaks, stand up paddle boards and more! We carry all the top brands: Quiksilver/Roxy, Rip Curl, Toms, Patagonia, Reef, Sanuk, Billabong, Island Company and many, many more! Visit our outdoor adventure kiosk located on the harbor across from the shop. Opening daily at 8 a.m., Memorial Day through Labor Day, and offering hourly, daily and weekly kayak rentals, customers can pick between sit in and sit on top kayaks and stand up paddle boards. We continue to provide island visitors with the opportunity to rent surfboards, paddle boards, bodyboards and skimboards by the day or the week at our shop location at the corner of Silver Lake Drive and Highway 12 which opens daily at 8 a.m.
For those who want to experience Ocracoke from a different angle, we provide Kayak Eco History Tours daily at 10 a.m. and 6 p.m. leaving from our location next to the Anchorage Inn and SMacnallys. The tour is great fun for the whole family featuring history of Ocracoke, pirate history, birds, fish and more! Reservations are required - please call 252.928.6311 or visit www.surfocracoke.com.